Rob: Alright, welcome back Becoming Your Best podcast listeners, this is your host Rob Shallenberger. We hope you’re having a fabulous day wherever you are. The truth is, whether you are or not, the hope is that this podcast will help lift you and make today a better day than it already is in that spirit of good, better, best. So we have a cool guest on today. Her name is Karen and I’m going let her introduce herself a little bit more. But here’s just a brief background on Karen. She is what we call an ultra-athlete. In other words, she’s done the Ironman triathlon and I’ll let her share a little bit about what that means. But first of all, I tip my hat to anyone who has done the Ironman. The most I’ve done is a little sprint triathlon and that was enough to test me on my swim capability. So my hats off to anyone who’s done a full Ironman Triathlon. She has a very cool background and experience as far as in the corporate world, doing a lot of different things, helping leaders, developing leaders. So with that being said, Karen, welcome to the show and maybe give us, if you don’t mind, just a little bit of background on who you are for our listeners, if that’s all right. Karen: Yeah. Hey, thanks Rob for having me on. I am thrilled to be here. It really is a show that I love and a topic that is one of my favorites, becoming your best self, good, better, best. So my background is for 28 years, I was outwardly successful in business, starting in commercial real estate, and climbing the corporate ladder, becoming an executive. Was a successful business coach to my team members during that time and to put this in perspective, this is before business coaching was even a thing, right? That wasn’t even a thing back then. Nobody had a business coach. You were just a good leader and you built your team and it was largely true either mentoring or coaching. And for me specifically, I would always think, “Well, the folks that compete in the Ironman World Championships are elite and I am a recreational athlete, so I couldn’t possibly compete,” and then boom, with the snap of a finger, that dream would just evaporate. Then every year, I would see coverage of the Ironman World Championships again. I thought it was by coincidence, but I know it’s not because this was my destiny and it was also my gateway to living my purpose in life and understanding what that was. So I would just catch the coverage and be emotionally moved to tears every time. The reason is, because I saw that as perhaps, you know, thinking to myself, “What if I have what it takes inside of me to do that and I’m not tapping into it? What if I’m just living this safe, small life only doing things that I know I can do, that I know I can achieve,” which is essentially what I was doing. You know, when I thought about and saw the Ironman World Championships, it stirred up something really deep inside. What I later discovered was that you know, it was my unconscious mind just trying to keep me safe because that’s really how our unconscious mind works. 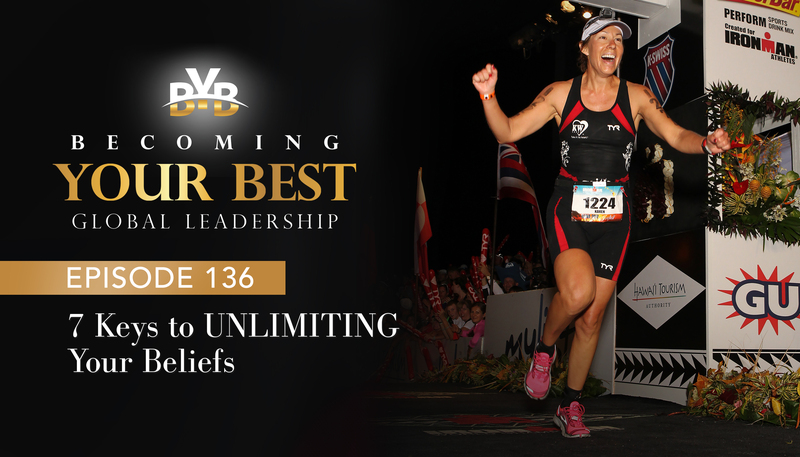 Once I came to understand that limiting beliefs are a scientific thing and that then there’s a scientific key to being able to conquer and transform them, I went all in on pursuing the Ironman World Championships at age 44. And because I kind of backed into and discovered the power of using your unconscious mind and these scientific keys, I achieved that dream in two short years and it opened up my entire life. I discovered my purpose, you know, what my destiny is, and took steps to be able to step into that and live it every day. Rob: Again, like I said in the beginning, hats off to you, Karen for doing that because so impressive. You know, one of the most inspirational experiences I’ve had is when we’re in Sydney, Australia, at a large conference and while we were there, we attended the Asian Pacific Championship Ironman triathlon. We just went to the finish line and watched people cross the finish line after 9, 10, 11 hours. I’ll tell you what, for any of our listeners, if you’re ever feeling a little low on motivation, if you’re ever feeling like you’re in a little bit of a funk, go to the finish line of a marathon or go to the finish line of a triathlon and watch people cross the finish line. You almost can’t help but be inspired because, you know, you’re talking about limiting beliefs and removing these. It’s one thing when you watch the first place finishers cross because they usually look pretty good. I mean, they cross the finish line and they just walk around. But when you’re staying there at the 11 and 12 hour mark, a triathlon, and you’re watching people that have thrown their heart and soul into it and they’re dragging themselves across the finish line, man, it is moving. It’s almost tear jerking moving, because you’re seeing people overcome something that many of them at some point didn’t know if they could ever do. Pretty awesome. I relate to what you’re saying there, Karen, as far as that experience of overcoming limiting beliefs, which ties into your book that you released Unlimiting Your Beliefs and I believe it’s The Seven Keys to Greater Success In Your Personal and Professional Life. Is that right? Rob: And maybe tell us a little bit about what that is. Why would that apply to our listeners? I mean, you’ve had this experience you’ve gone through personally. What’s in the book? And then maybe we can get into some of those keys. Karen: Yeah, absolutely. So I wrote the book, because during this two year journey to actually achieve this lifelong dream that I had, I discovered, like I said, the power of the unconscious mind, and specifically these seven keys that lead to greater success in your personal and professional life and they’re scientifically proven. So it’s not just, you know, me and my story. You know, “Hey, why don’t you try this maybe it’ll work for you.” These live in our unconscious mind and our unconscious mind is responsible for driving the majority of our thoughts and actions every day. In fact, it might be helpful for your listeners to know this statistic. Your conscious mind only comprises point 0.008% of all of our decisions and actions that we take every day. The rest comes straight from your unconscious mind. For the sake of our conversation today, let’s just define the unconscious to be the same thing as the subconscious. Because I get that question a lot. Is the subconscious the same as the unconscious? Without getting really scientific, for the sake of this conversation with, let’s just say the two mean the same thing. It’s really, you know, the things that you do, sort of unconsciously, unknowingly. When I realized this, you know, through discovering it in that two year journey, and then I wanted to know more. Like, I wanted to become a master of this area. So I studied cognitive psychology and got internationally certified and did research and a lot more study. I really wanted to know all that I could about this area. What I found was that this is the good news. Like, once we understand how our unconscious mind works, then we can make the changes that we want to make. We can, you know, make it work better for us because the main reason that I wrote the book and want to share it with everyone is that limiting beliefs, I see, are the number one thing that hold all of us back from what we really want. Whether it’s in our personal or professional or both lives. And once we understand how to work with that system, and how that system works, honestly, we can transform limiting beliefs into unlimiting and achieve anything and everything we want. You know, there are many, many examples of this throughout history. I mean, if you look at any top achiever out there, whether they knew this or not, they were harnessing the power of the unconscious mind and unlimiting their beliefs. You know, our current day, if you look at the inventor of Tesla or Oprah Winfrey, or Ellen DeGeneres, I mean, just anybody that you can point to, Elon Musk, Richard Branson, anybody that you can point to that we consider an icon of achievement, this is what they’ve done. Rob: Yeah, without a doubt, I agree with you. And as, as many of our listeners know, because they’ve been in our Becoming Your Best seminars, there’s this topic that comes up of neuro plasticity. You know obviously what this is. I’ve heard a fair number of people say, throughout time, you can’t teach an old dog new tricks. In other words, that’s just who I am. I can’t change it. We know now that that’s just not true. That people can change. Now, it comes easier for some than it does for others, we get that. But it’s true, we can change our beliefs and this programming. It is kind of like a computer. From the time we were young, we’ve taken these comments from our parents, our teachers, our friends, we’ve internalized them. In many cases, that’s where we get our beliefs from. And it’s also what limits us many times. So what, first of all, Karen, are the seven keys? So maybe you could briefly articulate the seven keys, and then choose one or two of them that you think would be the most impactful. If you just had a few minutes with someone what could you share? You know, which key or what would you share with them in just a few minutes that would really have a big impact in someone’s life? So maybe, let’s start first, what are the seven keys? Just briefly list those if that’s all right, and then what’s one or two, that would really have a big impact in someone’s life. Karen: Absolutely. And I’ll even go one step further. The main key in the book which is, you know, conquer limiting beliefs, I can actually walk listeners through in two minutes, the scientific technique on how to do that with the information that I’ll give at the end of the show. There’s some tools that I’m giving to your listeners totally free should. Keep it to yourself. No, actually share it with everybody. So your listeners will have everything that they need to really get started and to transform their limiting beliefs. So the seven keys are, conquer limiting beliefs, number one. Number two, is tap into the dream. Number three is, know discipline. That is a play on words but you may have to pick up the book to understand what that means. It’s very powerful and appropriate in today’s society. The next one is, do whatever it takes and schedules, equals goals. The next one is, make a decision and verbalization. Number six is hire a coach. And number seven is, hit your goals, enjoy the victory, set new goals and dream again. Rob: Yeah, I love those. First of all, before you get into them and I don’t know if you’re familiar with what we did, Karen, as our background, but we’ve had 40 years of research into what sets apart great leaders and high performers, and what makes them different from everyone else. As you listed several of those, they’re very much tied into some of those 12 principles that you see over and over. So that answer doesn’t surprise me at all. Some very powerful things that you just mentioned. Maybe let’s walk through that little two minute activity or exercise. It sounds like it’d be fun. And let’s try it. Karen: Yeah, great. And just to tag on to what you said there about your 40 years of research and the principles that you’ve identified, I love them and I can see how they work really well. This is the main reason I was so excited to be on your show is because the information that is presented in my book and the keys really is a great support to the principles that you’re bringing to light for everyone, you know, that you found in research. So these two things go hand in hand. In fact, I think, you know, these precepts makes carrying out your principles, even easier, even faster, and even more sustainable. So let’s hit it. So here is how you conquer limiting beliefs. This works best when you actually write this down. So for anyone that might be listening in the car, please don’t, you know, try to write this down as you’re driving. Maybe, you know, listen to the podcast again, when you get to your destination and you’re in a position to write this down. But writing things down and journaling, which is you know, one of the reasons why journaling is so effective is because it is a doorway into the unconscious mind. So first thing we’re going to do is just take out a regular piece of paper or you can write this in your journal. This is one of the tools that I’ll offer at the end. I actually have a document that you can use for this, but you can also use a regular piece of paper or regular journal page. So let’s just begin there. We’re going to begin with a question because I’m often asked, “Well, what if I don’t even know, you know, what limiting beliefs are holding me back?” Because some people do know them. I mean, I carried around mine for 28 years. So I was really well acquainted with it. But some people aren’t as familiar or don’t know, what is a limiting belief? So we’ll start with a question to uncover that. And that question is this, just write this on the top of your page. What is holding me back from achieving my dream? Just fill in whatever your dream or your goal is? Okay, what’s holding me back from achieving that? And here’s the thing, at first, you know until you’re kind of used to asking yourself, your unconscious mind, these questions, because, believe me, the unconscious mind has the answers. But until you’re used to that, and it’s probably a new habit for our listeners, until you’re used to it, your reactionary answer, it’s probably going to be, I don’t know. So ask yourself that question and just write down whatever pops into your brain. That is usually the right answer. Don’t overthink it, don’t marketing spin it or write down something that you think you should. Just whatever is the first thing that pops into your mind. And maybe several things pop in. Here’s where the next step in the technique comes in. Every limiting belief that you come up with, every answer that comes to your mind, write those down on the left hand side of the page and just jot them down, capture them exactly how they flow into your mind. Now what I found in doing this is, I thought I just had that one limiting belief. “Well, they’re elite athletes and I’m a recreational athlete, so I couldn’t possibly compete there.” What I found is that I had a whole page of limiting beliefs that were also holding me back. It wasn’t until I went through this exercise that I uncovered those. So make an exhaustive list. Keep asking that question until you really have no additional answers. Then the next part is, go back up to the first one on the left hand side of the page and in the right hand margin write the exact opposite of that limiting belief. So for me, I wrote, I will compete in the Ironman World Championships. And then I took each one after that, and wrote the complete opposite on the right hand side to the page. This is the unlimiting version of that limiting belief. Now comes the really fun part, which is changing the habit, it’s changing that habitual thought pattern that you talked about a moment ago, Rob, which is, and this is why we write this down, take this list with you, capture it on your phone if you need to, this is a good reason to use this in a journal format. Because if you carry your journal with you, you have it with you. The point is, you’ve now created a higher level of awareness by writing these things down and getting them out of your mind. And then we’ve got to change this thought pattern when it happens in the moment. So carry this list with you and when you notice, you are thinking those limiting beliefs, stop what you’re doing and actually verbalize the opposite or the unlimiting version of that belief. So it goes exactly like this. As I was going through my day, I would notice that I would have that limiting belief about the Ironman and I would literally stop what I was doing and I would say, “I will compete in the Ironman World Championships.” That is a really effective, quick way to rewire those habitual thoughts. Because think about it, if I’ve thought this for 28 years, that is my unconscious mind thought pattern. That’s its go-to, that’s its default. So if I want to actively change that, I have to do just that, I have to actively change it. At first, listeners, it’s going to feel contrived, like you’re talking yourself into it. And you know what, you are. You’re talking your unconscious mind into what you want to do, what you want it to believe, and to take action on for you. Or to help you take action on. So the first day, yeah, it might be a little rough and you’re going to be doing this a lot because what you’re coming to understand is how many times a day these limiting beliefs actually go through your mind. I guarantee you, it’s far more than you’re aware of right now. Every day after that, it’s going to get easier. They’re going to happen less and less and over time you’re going to eradicate them, you’re going to transform them. Then the cool thing that happens is, you’ll also start to be able to visualize what it is you want to achieve. You know, for me, I would be able to visualize what it would look, feel and sound like to be in Hawaii, and to be, you know, swimming in the ocean with the other competitors, and to be riding my bike up to Havi and making the turnaround. And then what it would be like to run on the Queen K and the furnace is present when you’re there doing that. And hear what the finish line sounded like two miles away. You know, at 10:45 at night, when I was finally running down Alii drive. You know, what the air felt like on my skin and what it felt like to be crossing that finish line and to be an Ironman. That’s the other thing that happened from that visualization is, it starts to become your identity. Because you can see yourself doing it, you feel what it’ll feel like, you hear what it’ll sound like, your unconscious mind says, “Okay, well, we are that then. That’s who we are now.” Then it becomes easier and easier for you to do whatever it takes, which is the fourth key in the book, you know, which is my case was three workouts a day, six days a week. You know, doing all the things that it would take me to get there. But it seems so much easier because I was tied in with these keys and the power of my unconscious mind. Rob: Well, first of all, Karen, that was fabulous. So thank you, I typed up those questions and I’m going to do that myself later today. We’re on a drive, it’s going to be a two hour drive and we’re flying to New York tomorrow. We’re dropping our kids off at the in-laws and I’m going to do this with my wife on the drive. So I’m looking forward to that. Rob: Just to support what you said, and I know there’s different studies from different people and, you know, statistics can say whatever we want them to say. But nonetheless, there’s a couple statistics that I have seen and I believe them to be fairly close and in the ballpark. That is, the average person will have 40, and I’m going to support some of the things you said here, the average person will have 40,000 to 50,000 internal conversations with themselves per day. The average adult, 70% of their thoughts tend to be negative. You know, there’s a couple of quotes, whether you think you can or you can’t, you’ll probably be right. Karen: Yes, that’s one of my favorite. Rob: What my friend Thomas Blackwell says is, what we think about is what we bring about. So what you’re really doing here is, and it’s actually one more that’s really critical, and you’ve mentioned it and you said it was critical, and I agree, and that is that writing it down is an absolute essential part of this. I know there will be people listening to this who say, you know what, I’ll just do this in my mind. I would think you would agree with me that that doesn’t work. There’s something about writing that unlocks a part of the brain that otherwise will stay dormant. Rob: The subconscious, and we’re talking about accessing an area that we sometimes put some blocks around. It’s not until we start writing this down, that we can really access it and thinking alone about it is good, but that typically won’t do it or even approach anywhere as to what writing it down on paper actually does. Karen: Absolutely right. Yes, it is a direct doorway into opening up the unconscious mind. And it’s not the same, that same doorway is really not there if you just think about this silently. It doesn’t do the same thing. Rob: Yeah, Amen to that. You know, this has been great. I invite all of our listeners to actually do this today, and an access and see what’s in there and where we’ve been limiting ourselves because 100% of human beings are subject to this. No one is exempt from limiting beliefs. We get it as we mentioned at the beginning of the podcast from teachers, you know, well-meaning parents who say things that we lock away in our subconscious and then that leads us a certain direction. So we all have these limiting beliefs. It impacts our lives in many ways that we may or may not even realize. So I’m looking forward to doing the same thing this afternoon, Karen and I appreciate that. Prior to jumping on the podcast, you said that you had some things that you could give to our listeners. So what could you offer to our listeners that would help them? Do you have a website, social media, anything like that? Karen: Yeah, you know what, we make it really easy to pick up these free tools that we give just to your listeners and for you to be able to take these tools and use them right away. You know, it’s plug and play. So if you go to Velocity, which is the name of my company, velocityleadershipconsulting.com/byb, short for becoming your best, then you can pick these up. What we’ve got for you is really cool. Oh my gosh, I get excited about this every time I talk about it, because these are so readily usable and so valuable. Honestly, I’m giving you the best stuff for free. So go get it. So the first thing is a playlist of five really short videos. I mean, we’re talking micro short, these are under two minutes each, of how to use these unconscious mind techniques. So the seven keys that I talked about before, I’ve offered five videos on how to utilize these techniques. Unlimiting your beliefs that we just went through was one of them. Then the form that I talked about is a document to capture your limiting beliefs, and then transform them into unlimiting, that’s on there. So literally, you can just go today, after you listen to the podcast and plug into these and start to open these things up and achieve whatever it is that you want. Then also, there’s a link to the book because there’s a lot more detail and science in the book about how to do these things and how they will work for you. And then, there’s also a link to my website and you can set up a live chat with me if you’d like to. Rob: Yeah, well, thank you, first of all, for offering that to our listeners and I hope that everyone that is listening will take advantage of that. So can you say one more time? Karen, please the website so that we all have it again? Karen: Yes, absolutely, velocity, so V-E-L-O-C-I-T-Y, leadershipconsulting.com/byb. Rob: Perfect. Well, that’s awesome. So I hope that our listeners will take advantage of those. I’m extremely confident they would be helpful. They’re very aligned with what are predictive of success. Karen, it’s been an honor to have you on the show. I cannot believe that 27 minutes has flown by just like that. So any parting comments? Any thoughts, Karen, as we wrap up? Karen: Yes, I would say, based on what you and I have both shared here and confirmed, you know, the science of how people’s minds work and specifically with what you shared at the tail-end of this interview about, you know, 70% of an adult’s thoughts are negative every day, and so on. That’s absolutely true. I urge listeners to, first of all, conquer and transform your limiting beliefs because that is the biggest opener to your life and to the success you’re meant to have, and fulfillment and happiness. Second of all, go big. Like, if you are thinking about doing anything, I would say that your natural unconscious mind tendency is going to be, you know, keep you safe and think about things in a realistic fashion. Realistic is one of my least favorite words. I think we should eradicate it, remove it from our vocabulary, because it’s so detrimental. So I would say to the listeners think big. You know, go for the biggest, scariest, most outrageous, ridiculous dream that you can think of. Because that will be such an expansive opener for every part of your life that it will blow your hair back. It will be amazing for you. So instead of, you know, keeping it safe and small and real, go big and crazy and outrageous. Rob: That’s awesome. I love it. It makes me want to jump up out of my chair. Well, Karen, thank you so much for being on the Becoming Your Best podcast. We’re grateful that you’ve taken the time to do this. You’re doing some awesome things. And again, I encourage our listeners to go there, urge you to do that. Just a reminder for all of our listeners, coming up in September is the Breakthrough Entrepreneur conference for those of you that have a business or something you’re trying to grow. If you also want to come to the Breakthrough Leadership Conference, we’ve been getting numerous emails about those dates, that’s in October. Go to the website becomingyourbest.com for the dates. Some of the questions we’ve had recently are, is this something you can send team members to if you have an up and coming leader in your organization, or could you even send a mature teenager? The answer is yes to all of those. So go to the website, look at the dates and if you have team members, or you would like to come, make sure you register because those will fill up and sell out here in the near future. So again, Karen, thank you so much for being on the show. We appreciate you and remember that one person can make a difference. Now let’s go out and have a great week.